I purchased the TimeCutter mower as it previously took me the majority of the day to mow my yard. I mow three acres and even with my wife and I mowing at the same time, it was taking over three hours to mow the grass (six hours for one of us). The mowing time has now been reduced to two and a half hours – what a savings. An unplanned benefit of the TimeCutter was the decrease in fuel consumption. When running two mowers, we would consume approximately give gallons of gasoline. The TimeCutter takes less than two gallons per mowing – a big savings when one mows twice per week. The downfalls of the TimeCutter are fairly minor. The grease caps that sit above the front wheels have a tendency to get knocked off rather easily. As I mow around pine trees that are only a few years old, the branches hit the caps, causing them to fall off. Unfortunately the majority of the time it is not noticed and they end up being run over. But they are not that expensive to replace – around $3 apiece. The other issue with the TimeCutter is the traction the mower does not have – when the lawn is wet, it has a tendency to skid along and tear up the grass when changing direction. If the tires had a better tread, this may help alleviate this problem. Or if the mower was a bit heavier this may not happen. The mower was reasonably priced (less than a tractor) and the time savings achieved alone made the purchase well worthwhile. The added bonus was the fuel consumption. The reason I would not give it a 5 is due to the mowing performance when the ground is wet and the grease caps falling off. I have a toro ss 42" timecutter 2011 model. i cut residential lawns for extra cash and it mows good. traction is better on new model (2011). does great only thing is that doesnt come with hour meter. bought that online and a stripping kit. stripping kit looked sketchy but works grate. In response to the previous post...I've owned a Toro Timecutter (Toro's residential version of their Z series zero turn mower) for about 10 years now and have had no problems, but especially with the front wheel grease caps coming off. Mowing wet grass has never been advisable either, so the 2 cons the last post give were kind of unjust in my opinion. 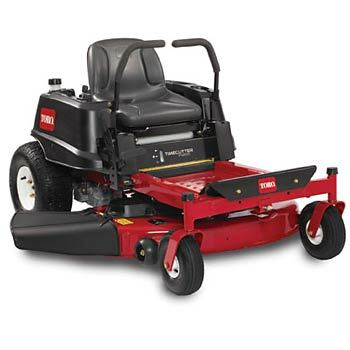 If you are mowing a residential yard and by no means using this mower for commercial use, you cannot beat this mower. In fact I'm retiring my 17-44 to another family member and going to buy the newer 50" cut with a 22hp Kawasaki engine.